Midterms and finals at Michigan are one of the most hectic times of the year. While many of us are overachievers, we may feel stressed out and overwhelmed. 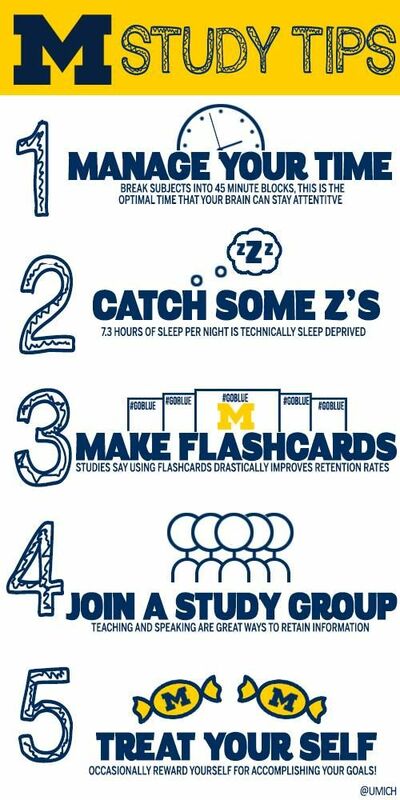 To help you put the week(s) in perspective, here are our a-maize-ing tips to keep stress levels low and hopefully help you succeed! Start studying early. Don't procrastinate! Nothing can raise stress levels like a 24 hour cram session for months worth of material. There’s a reason professors give out midterms and finals dates at the beginning of the semester: they want you to start studying early. Spreading material over multiple days (even weeks) will make the study process far less painful. This is especially true if you have multiple exams and projects close together. Time management is the key to success! Make a Schedule. Plan your midterms/finals week schedule ahead of time and mark down check points for you to complete work as due dates approach. Most of all, prioritize what is most important on your to-do list and what can ultimately wait. This will help you stay organized and plan accordingly. Set mini goals. Have a 12 page study guide that is nearly too daunting to begin? Tell yourself after 3 pages you then can go on Facebook for 10 minutes or check your phone. Give yourself small incentives to work toward to stay motivated. Study Strategies. Take advantage of additional resources posted by your professor. ​​If your professor provides you with study guides or review questions from previous exams, use them to get a better idea of what material will be on the exam and what areas you need the most help with. Some professors hold review sessions, which can be very beneficial because you can gain insight on how an exam will be structured and which topics are of most significance. If your professor does not hold a review session, ask him/her if they would be willing to have one. You can always go to office hours and ask any questions you have! The Sweetland Writing Center is a helpful resource for paper and essays. Make Outlines, Concept Maps, Notecards. Outlines can help you retain information better by focusing your studying and allowing you to pick out key points. Concept maps are a great idea because they help you visualize concepts and how they connect to different topics and ideas, as well as allow you to gain a bigger picture understanding of the material. A great resource for making online notecards is StudyBlue - you can even see what other students in your class are putting on notecards and then TEST yourself! Remove Distractions: While studying, try your best to get rid of any distractions. Turn off your cell phones, TV and unnecessary electronic devices. To resist temptation, you can use apps, such as SelfControl, to block certain websites for a period of time. Remember to sleep. As silly as it sounds, sleep is key in the homestretch. All-nighter after all-nighter, coffee after coffee will not benefit you in the long run but rather result in your lack of focus when you need it most. Chugging caffeine and energy drinks will mess with your sleep cycle in the long run, don't do it! Go to CAPS. We know how work seems to pile up during this time. If you need a break, go to CAPS. Maintaining your mental health is important. In addition to counseling, CAPS offers the “Wellness Zone” where you can use massage chairs, light therapy, the napping area, and much more. CAPS is located on the third floor of the Union. Wear comfortable clothes. Here is the opportunity you have been awaiting, the moment you can wear sweats at the library and get away with it. Carpe diem! Do not dress to impress when studying, dress to be as cozy as possible. Layer in the library. In addition to dressing comfy, dress warm. Often the libraries on campus are not the warmest, plus once you sit still for hours on end pounding concepts into your mind, you tend to get chilly. Make sure you bring layers to maintain some warmth in your study-a-thon. Snacks. You will have some late nights, which messes up your daily schedule. Make sure to keep eating! A lot of people will spend all day studying and forget their body needs nourishment. Fun fact: you study better if you keep a good diet! Buckle down to get work done with your favorite healthy goodies. Listen to good music. Do not be the complaining roommate. On the way home, listen to music that puts you in a good mood to cure this problem. We all have exams and papers, we all are struggling, we all know there are not enough hours in the day. If you need to complain, call your family! Make home a sanctuary. Do your best not to study or work at your house. This should be your time to relax, catch up with friends, and take a break from your rigorous schedule. When you step inside leave all finals worry outside. Remember to keep calm and keep things in perspective. The most crucial aspect of finals is to keep composure. When it seems like there is no light at the end of the tunnel, remind yourself you were accepted to the University of Michigan for a reason. We are all leaders and best and finals week is just another time we get to show it off to one another, our professors, but most importantly – ourselves!